Eliminate the Headaches of Tape! 12 TB USB 3.0 Transportable External Drive Available! Semi-rugged removable disk cartridge features the highest capacity in the industry (2-3X higher than RDX! ), patented 1200 Gs shock protection, and fast performance. Used with: Internal 5.25" SATA docking bay or External USB 3.0 docking station. Hot-swappable. 10+ Yr Mechanical Design, Proven By Military! This internal 5.25" SATA docking bay is used with RHD removable cartridges. The bay installs into a standard 5.25” slot and has convenient SATA connectivity & standard 4-pin MOLEX power port, enabling easy integration into towers or 19" racks. Supports hot-swap of RHD cartridges (requires hot-swap host SATA port). Withstands 1000s of insertions/removals. External desktop USB 3.0 docking station for RHD removable disk cartridges. Easy plug-n-play with USB ports on laptop, workstation, or servers. Supports hot swapping of RHD cartridges. Withstands 1000s of insertions & removals. Fast data performance. Our NAS, SAN or Direct Attached 19" rack solutions are versatile and offer high performance. These 19" racks are populated with Olixir transportable drives, which can also be re-used as stand-alone external drives in JBOD rack configurations. Olixir Desktop Towers can be used with our transportable and removable hard drives in a variety of configurations. 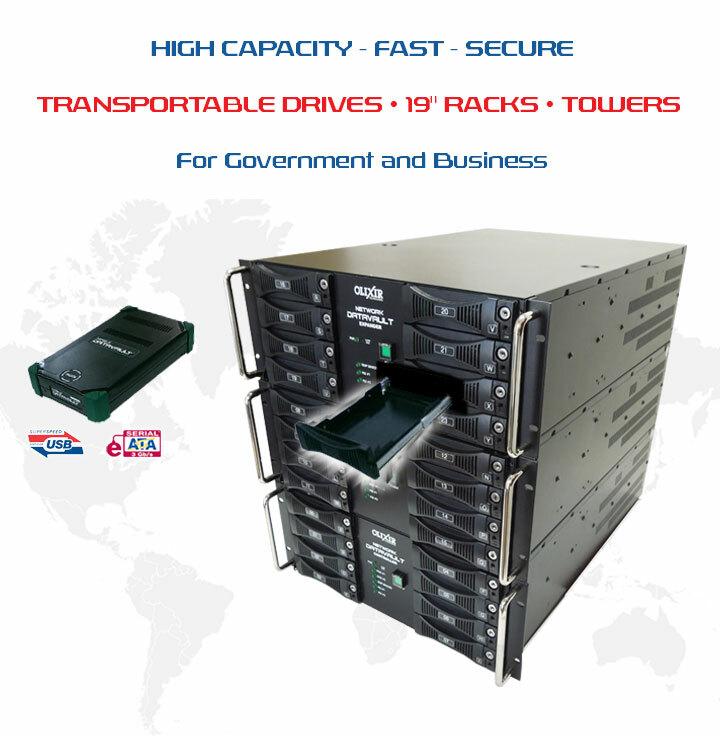 Supporting 1-7 removable drives, these hot-swap towers offer fast performance and can be easily transported via an optional transit case. Our new ultra-fast, highest capacity semi-rugged external hard drive protects your data from knocks, jars, and drops using patented shock protection technology. Blazing USB 3.0/eSATA performance. Use with cable, or in a tower/19" rack. This ultra-rugged. lightweight external hard drive protects your data from drops and operational vibration with patented technology. Bus powered USB 3.0 or eSATA capability. Use with standalone cable or in a tower/19" rack. Our most rugged, extreme temperature range, lightweight and fastest external drive protects your data from drops and operational vibration with patented technology. 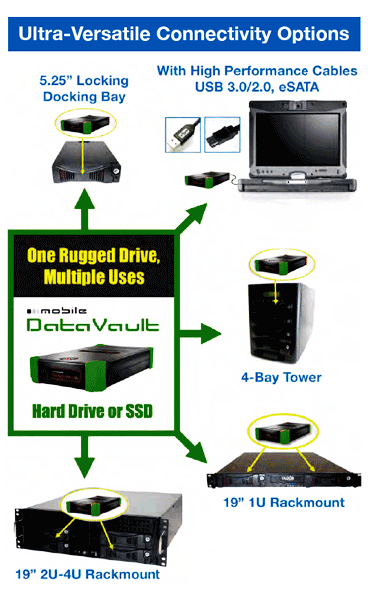 Bus powered USB 3.0 or eSATA capability. Use with standalone cable or in a tower/19" rack. Olixir’s docking bay can be used with our entire family of removable drives, which offer up to 12 TB in capacity! The docking bay installs into a standard 5.25” slot and has convenient SATA connectivity – allowing the bay to integrate into a wide range of workstation/servers, 19” Racks, and other towers. Removable drives can be hot-swapped from the docking bay. This docking bay was designed for use in both stationary and vehicle/air applications.